“Please let there be eggs,” Mercedes wished as she checked the chickens’ nests. Except for one small egg, there was nothing. Eggs were valued more than gold in West Berlin during the Russian blockade. Perhaps the chickens were frightened by the noise of the planes during the airlift. Mercedes never complained about the “Raisinbombers,” the great soaring grocery stores that brought relief to the people of West Berlin. Mercedes went to the airfield one day with her mother in hopes of catching a candy-filled parachute, but a large boy reached up and grabbed the one falling towards her. 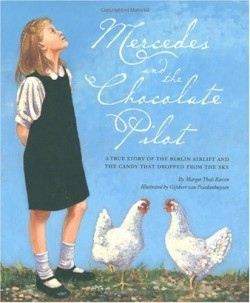 That night, the girl wrote a letter to the chocolate pilot asking him to drop some candy over her house—the one with the garden and white chickens. Mercedes waited in her garden each day, but nothing floated down. One day a box filled with candy arrived in the mail: Halvorsen was worried that he wouldn’t have enough time to find Mercedes’s home when he did his run, so he mailed her a parcel. Years later, as commander at Tempelhof, Germany, Halvorsen received an invitation to the home of a German family whom he had never met. He was met at the door by Mercedes! The author, a nationally recognized, professional writer, has won several awards, including an IRA Teacher’s Choice award. Raven’s storytelling manner keeps the reader eagerly turning the pages. The illustrator was Art Director for the Michigan Natural Resources Magazine for seventeen years, and has illustrated many books. His life-like paintings spread across both pages and one can sense the love and hope of the mother and daughter. Both writer and illustrator had the opportunity to meet with Colonel Gail Halvorsen. This inspiring true story of hope and goodwill would be an excellent beginning to a history lesson and should be included in elementary and junior high school libraries.